Following the announcement yesterday made by HPE and Nutanix, here is a closer look at which models from HPE is ready to run Nutanix Enterprise Cloud. This list comes on top of the HCL that Nutanix already offered with their Nutanix Enterprise Cloud OS running on HPe Proliant models. 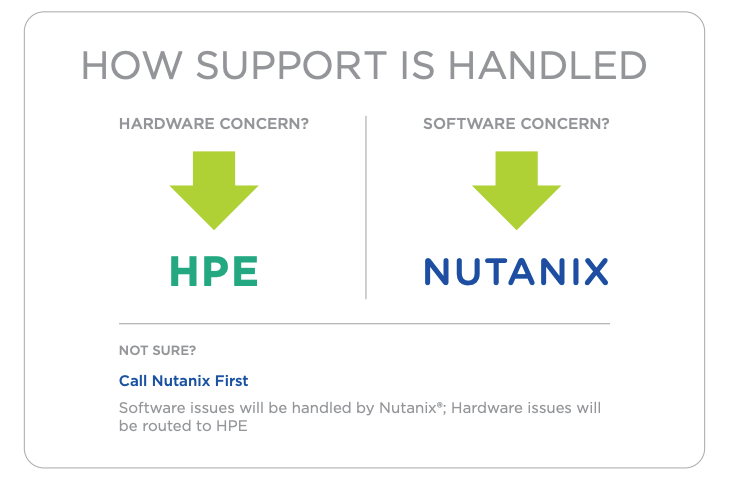 Nutanix is committed to delivering the highest level of support to customers running Nutanix Enterprise Cloud OS on validated HPE® ProLiant® platforms. Nutanix has steadily expanded its portfolio of hardware platforms that are validated to host the Nutanix Enterprise Cloud OS Software. Following initial appliance offerings, Nutanix added support for other third-party servers, IBM®, Dell EMC® and Lenovo™ appliances through collaborative OEM relationships. Responding to market and customer demand, Nutanix added HPE® ProLiant® servers to its portfolio of validated platforms. Nutanix Enterprise Cloud Software is certified to be deployed and fully supported on HPE® ProLiant® DL360 and DL380 Rackmount Servers.